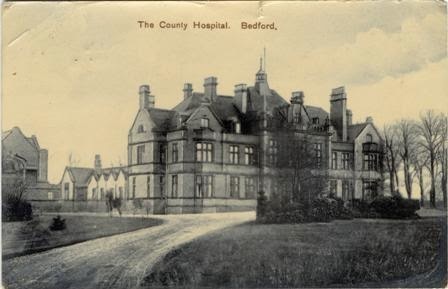 6th September 1914, Bedford: The County Hospital at Bedford has offered fifty beds to be used by wounded soldiers and expects to receive its first military patients any time now. They have asked for help from anyone able to lend bedsteads and mattresses to the hospital and also need bedding and clothing for fifty men. Walls. Should be good thickness. Their main face smooth, impervious surface, rounded angles at floor & ceiling, so as to facilitate cleanliness and avoid harbouring dust. Ventilation. Windows on opposite sides, one facing S.E. and the other N.W. Windows. With double hung sashes & fan light above, they should fall inwards with side cheeks to prevent down draught. Warming. Must be sufficient. The best system is that combined with ventilation & which warms incoming air. Bath must be warmed with hot water for baths, waste pipe of sink should have 3 inch base drain. Closets and sinks. Should be in an annex. NB. This applies to ward and hospital but as purity of air depends upon how often it is changed a less cubic capacity can be used in exceptional cases if ventilation is efficient. Ethel May Bacchus was born in Croydon c.1883 but had moved with her family to Bedford by 1891. She died in Bedford in 1976 age 94.